Twelve-year veteran and two-time Pro Bowl guard Evan Mathis likely announced his retirement via Twitter on Monday night. How do I announce my retirement? Evan Mathis shed his draft bust status to become one of the NFL’s best guards for the last few seasons. Drafted in the third round out of Alabama by the Carolina Panthers in 2005, he started his second season and then failed to keep his job. The Panthers cut him, the Dolphins cut him, and the Bengals chose not to retain him before he signed a one-year contract with the Eagles in 2011. 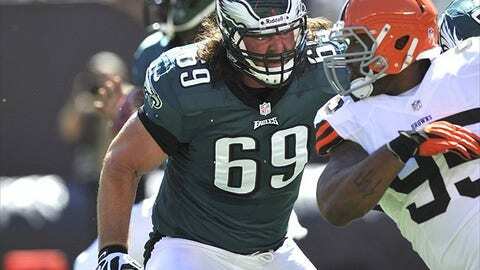 Evan Mathis’ exceptional mobility for an offensive lineman shone when he played for the Eagles. He won the starting left guard spot and excelled. Pro Football Focus rated Mathis as their top rated guard in the league in 2011, 2012 and 2013, and he earned a long-term deal to stay in Philadelphia. Chip Kelly released Mathis before the 2015 season when he was seeking a new contract. Mathis wasn’t a free agent long; the Denver Broncos were quick to add one of the league’s best guards. Mathis played well and was rewarded with a Super Bowl ring for his time in Denver. However, he was then 34 and hadn’t submitted a fully healthy season since 2013. The Cardinals gave him a chance and Mathis started five games before going down this year. There is a remote possibility that Evan Mathis isn’t retiring. Mathis is known for his sense of humor and the possibility that he is trolling everybody shouldn’t be completely dismissed. He also told ESPN’s Adam Kaplan that “I’m only going to play if someone lets me be a third down pass rusher.” and the possibility of an NFL team adding a 35-year-old guard to rush off of the edge is out there. But in all likelihood, Evan Mathis is retiring. He overcame a rough start to his career to become one of the league’s best players. He worked hard despite adversity and had an admirable career. The NFL will miss him.